Annie Abram was born in London in 1869 and died in Sussex in 1930. She contributed significantly to the twentieth-century historiography of late medieval England, researching the social, cultural and religious mores of the English laity and clergy. 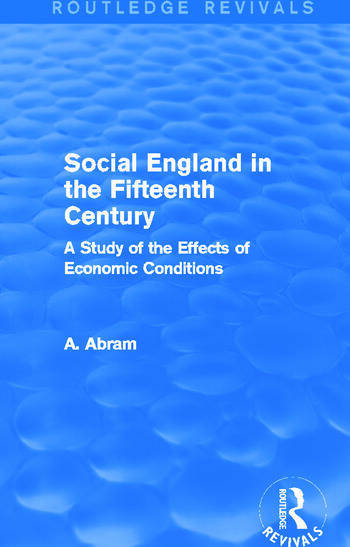 First published in 1909, this title explores the impact of economic changes on society during the fifteenth century. This is a period of important developments both socially and economically, which witnessed the rise of the middle class through industrialisation, agrarian change, and the growing economic and commercial character of towns. The chapters discuss these areas, as well as the industrial position of women and children, the economic position of the Church and the development of a national character. This is a fascinating classic work, which will be of great value to students researching the socio-economic history of late medieval England.